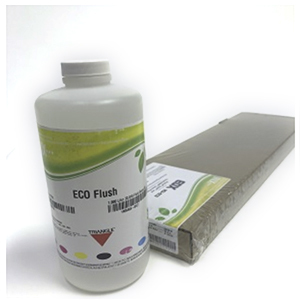 INX Digital's EcoBio Flush is chemically compatible with Roland's MAX and MAX2 inks. The 440 ml cartridges will fit in any Roland printer that accepts MAX or MAX2 ink. The cartridges are chipped for the INX EDX and RXV inks. Roland does not put chips on there cleaning cartridges. Chips can be removed for any Roland printers updated enough to read chip on the clean cart.